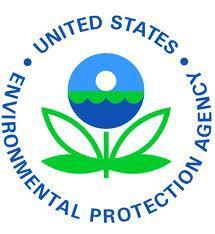 The U.S. Environmental Protection Agency (EPA) is adopting more stringent emission standards for new highway motorcycles. Under the current standards, which are over 20 years old, today’s motorcycles produce more harmful emissions per mile than a car or even a large sport utility vehicle (SUV). These new standards will reduce the combined hydrocarbon and nitrogen oxide emissions in the exhaust by 50 percent as well as the harmful health effects of mobile source air toxics. EPA has been working to reduce emissions from motor vehicles for over thirty years, including emissions standards for highway motorcycles that we adopted in 1978. 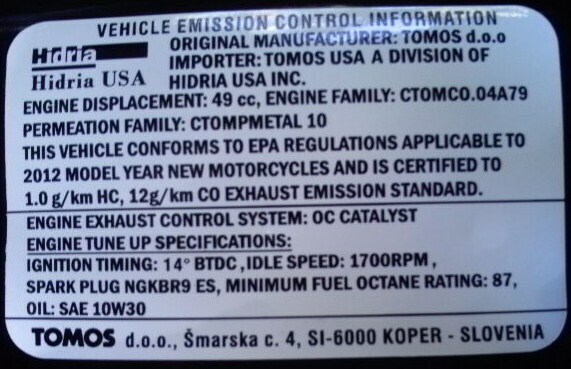 In this final rule, EPA is adopting new emission standards for exhaust and evaporative emissions from highway motorcycles. 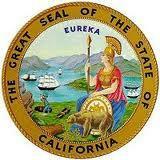 The standards are based on comparable requirements adopted in California. The final rule extends the California requirements nationwide two years after they initially take effect in California. In addition to updating exhaust emission standards for currently regulated motorcycles, the new emission standards will include previously unregulated motorcycles with engines of less than 50 cubic centimeters displacement (scooters and mopeds). We are also adopting new evaporative emission standards to control the loss of gasoline (described as “permeation”) through the walls of fuel hoses and fuel tanks. 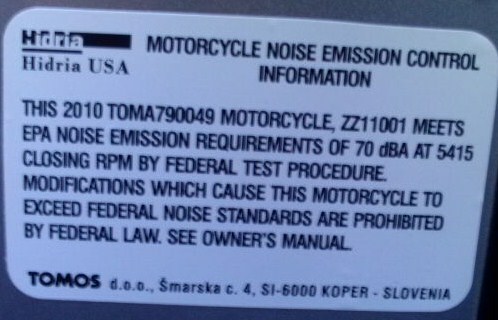 The permeation standards apply to all classes of highway motorcycles. 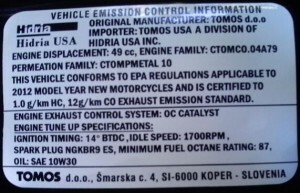 Before 2006 model year, Class 1 was Class 1b (50 to 169cc), Class 1a (under 50cc) was exempt. 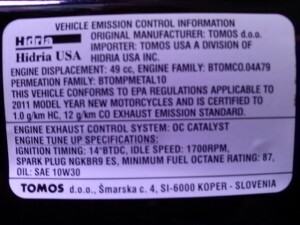 Because of the new EPA standards, most 49cc two-stroke motorcycles, scooters, and mopeds stopped being made after 2005. Tomos and only a scarce few others still make two-stroke street motorcycles, which must meet the same standards as four-stroke engines. Would new emission standards make it illegal to customize my motorcycle? Many motorcycle owners personalize their motorcycles. Indeed, this is one of the joys of owning a motorcycle, and owners take their freedom to customize motorcycles very seriously. 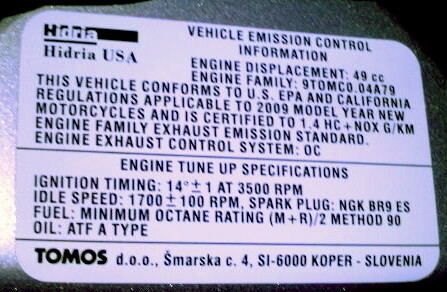 We are not changing existing provisions of section 203(a) of the Clean Air Act, as established in 1977, which states that it is illegal “for any person to remove or render inoperative any device or element of design installed on or in a motor vehicle or motor vehicle engine in compliance with regulations under this title…after such sale and delivery to the ultimate purchaser…”. 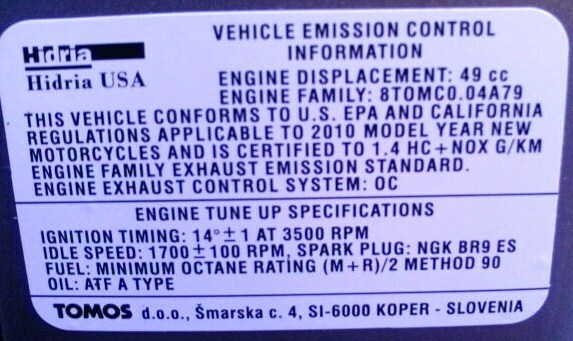 In other words, owners of motor vehicles cannot legally make modifications that cause the emissions to exceed the applicable emissions standards, and they cannot remove or disable emission control devices installed by the manufacturer. 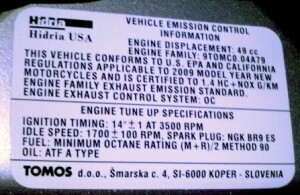 We use the term “tampering” to refer specifically to actions that are illegal under section 203 of the Clean Air Act; the term, and the prohibition, do not apply generally to the wide range of things that a motorcycle enthusiast can do to legally personalize their vehicle, only to actions that cause the emissions to exceed the standards. 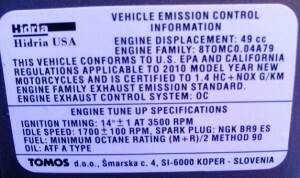 The new emissions standards do not change this “tampering” prohibition. In fact, it is not within EPA’s ability or discretion to change this statutory prohibition, which Congress put in place more than 20 years ago. Owners are still free generally to customize their motorcycles in any way, as long as they do not disable emission controls or cause the motorcycle to exceed the emission standards. Other emissions can come from the crankcase on a four-stroke engine, a result of blow-by past the rings, and from fuel that escapes into the air through permeation and evaporation, on all combustion engines. 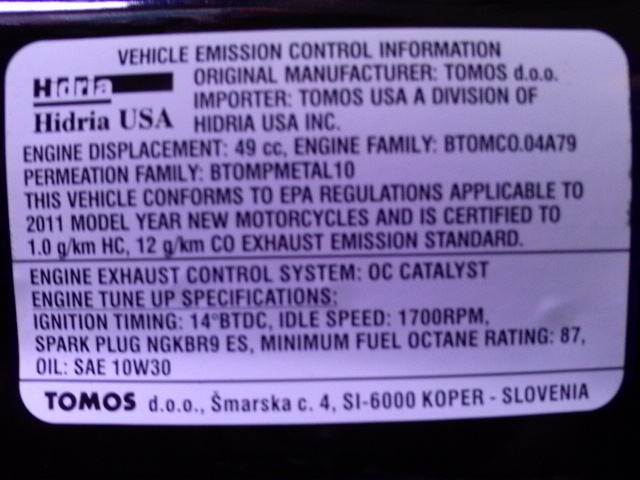 Vehicle Emission Control Information labels are required on all 49cc 2006-on US models. Motorcycle Noise Emission Control Information labels have been required since the early 1980’s. Besides exhaust emissions and permeation (evaporative) emissions, there are also noise emissions limits. Noise limits have been in effect since the 1980’s. 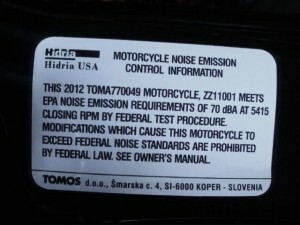 Since then it has been illegal to change the exhaust to a louder one, even though most motorcycle owners do it anyway. 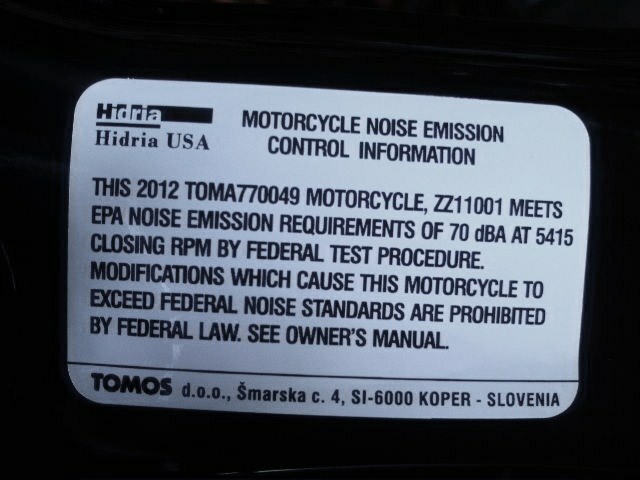 Above right, 2010 Tomos Noise Label says 70dbA @5415rpm. Above right, 2012 Tomos Noise Label, 70dbA @5415rpm. It’s been the same for many years. You are currently browsing the archives for the Environmental Laws category.